The American River Ultra Choke Free Dog Harness Tuxedo with 4 Interchangeable Bows has a classy and easy way to make each formal event different by changing out the bow tie with out having to shop for a new tux. 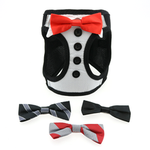 This designer dog tuxedo harness features a crisp white chest front has black buttons and lapel design. The collar has an easy-to-use hook and loop touch fastener bow tie attachment to quickly change out the bowtie for a different style. This dressy dog harness features a polyester mesh back to keep your dog cool when the party starts to heat up. Bow tie colors are Black, Red, Diagonal stripe Black/Silver, and Diagonal stripe Maroon/Silver. This is the perfect and safe dog formal attire for weddings, Christmas, New Year's parties, Valentine's Day and more! Available in a wide range of sizes to suit most dogs for any dressy occasion. American River Ultra Choke Free Dog Harness by Doggie Design - Tuxedo with 4 Interchangeable Bows Customer Photos - Send us your photo! Posted On 12/12/18 by Tampa from Tampa, FL Yes, Tampa recommends this product! Love this product with the interchangeable bows and the fact that it is a harness. Very convenient. Posted On 10/05/18 by Kimberly H from Baton Rouge, LA Yes, Kimberly H recommends this product! I am going to teach my new adopted fur babies to walk on a leash. I bought my little girl a lot of precious dresses on this site. The dresses came with matching leashes. Well, I have a precious little boy. I needed to get him a harness that would make him look as good as my little girl. Well, I spotted this one. I love it. I love the 4 bow ties. He looks so handsome in this harness. Posted On 07/28/18 by Brandy B from Mt Vernon, OH Yes, Brandy B recommends this product! This harness is too cute. Love the interchange bows, wish there was more. Fits him perfect. Posted On 01/30/18 by Susan G from West Lawn, PA Yes, Susan G recommends this product! My dashing dog is saving the debut of his tuxedo harness for Valentine's Day, but he'll be ready for any winter formals that come his way with four pawsome interchangeable bowties:) American River harnesses are always a great fit and well made. This thing is absolutely adorable! Posted On 08/26/17 by Laurie from , MN Yes, Laurie recommends this product! These are the best harnesses I have found for my little puppies. They feel very secure and seem comfortable. I love the added safety feature of the Velcro and clasp closures with double D-rings. Materials and craftsmanship are awesome. This little tuxedo is beyond adorable! Just be sure to follow the directions when putting it on your pup (be sure to angle the Velcro ends) and I'm confident they will become your favorites as well! Posted On 08/18/17 by DONNA N from AMHERST, NY Yes, DONNA N recommends this product! iT'S SUPER CUTE AND STURDY. LOVE THE DIFFERENT BOW TIES! RUNS SMALL THOUGH. MY 16 POUND DOG JUST FIT THE LARGE. Posted On 06/29/17 by Erica F from Ozone Park , NY Yes, Erica F recommends this product! My little Maxie is handsome by himself but the harness just makes him look like a total stud! I mean James Bond level doggy handsome. And the switchable bow ties make it perfect for whatever he needs to dress up for. Posted On 05/12/17 by Kathy from Alpharetta , GA Yes, Kathy recommends this product! Excellent and oh so cute choke free tuxedo harness just arrived !!! Bought this for my 4 1/2 pound Biewer Yorkie and it fits perfectly and does not put pressure on his throat. Love the videos that feature the products available from Baxter Boo. Fast shipping too !!! Posted On 04/22/17 by Rudy's Mom from Tehachapi, CA Yes, Rudy's Mom recommends this product! My little boy Rudy hates to wear clothes but he loves his harness because that means he gets to go. When I saw this cute little harness I knew it would be a wonderful compromise for us. It is well made and comfortable. Posted On 04/19/17 by Susan from Calgary, Yes, Susan recommends this product! The Tuxedo dog harness is cuter than I imagined. This harness is absolutely darling! It is truly choke-free and does not even touch your dog's neck making it very safe to use. Plus the tuxedo front and interchangeable bow ties give you a classy touch with no discomfort - to your furbaby, it feels just like only a regular harness, albeit a very soft comfortable one. Sizes are determined by girth; measure twice. I was very positively impressed with the quality of the tuxedo shirt front and collar set up - there is a white collar, white shirt front with real buttons, and Velcro for attaching one of four ties which are black, red, black and red, and grey and red. A great harness and a tuxedo in one. What's not to like? I love BaxterBoo's selection, prices and shipping choices. I have made many purchases and have never been unhappy with anything!